¡Announcement for non Members WAP! VIII CONGRESS OF THE W.A.P. 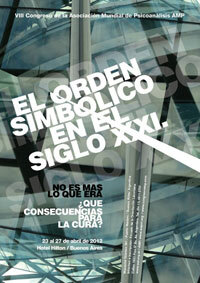 The symbolic order in the XXI Century it is not what it used to be. What consequences for the treatment? we have decided to receive non member papers for the Clinical Day. The final paper selection and acceptance decision will be in charge of the Scientific Committee. Deadline for paper submission will be January 15th 2012. General indications Papers should have a maximum of 4000 characters including spaces. Selected papers will be distributed among the chosen mentors, in order to facilitate a dialogue with the authors to begin a work of adjustment according to the theme of the panel in which they will be presented.